IEEE is built by its members and its volunteers, and we need to count on them to serve the profession, the society and humanity as a whole. There are many competing organizations and our members choose to be with us, we need to value that commitment. My experience in the different parts of IEEE allows me to understand the technologies we develop, the needs of our members and potential members, and the diversity in geography, culture and finances in Middle East, Africa and Europe. There are many ways of volunteering and they don’t need to be the traditional way of belonging to a committee. Other forms of volunteering, based on the internet, should be commonplace in the Region, so that everyone can contribute in some way, no matter their occupation, age, or place of origin. The Region will only flourish if we also have a dedicated team of strongly committed volunteers. Based on our experience in the last years, I’m convinced that we have many talented people in the Region that are willing to volunteer their time and effort. I plan to make every effort so that they feel welcome as new volunteers. Also, we have an extraordinary group of people that are currently volunteering; it is extremely important that we reward them in many ways to express our gratitude and our continuous wish to keep them in the family. It is very important that everyone feels welcome. Initiatives like Women In Engineering are fundamental to increase the participation of females and other underepresented groups. Technology is our profession and our passion and the reason we are here. It is important to empower our conferences, to make the public perceive them as a really valuable tool, not necessarily competing with conferences organized by IEEE societies. We will strengthen their technical content and make them truly regional conferences. My focus would be to attract topics and contributions that are related to the technologies which have relationship to the geographical area where the conference is located, so that they provide something unique as Region conferences. The Region can play an important role in encouraging technology transfer. 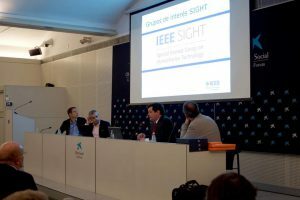 There have been successful initiatives by other IEEE units where the Technology Transfer Offices from universities and research centers are put in contact with companies by means of volunteers who gather potential opportunities. A similar project could be put in place region-wide. The Action for Industry program has shown great potential and will be promoted and expanded. Keeping the members informed in the way they want without overloading their inboxes. We need to modify the way we communicate with members. R8news is a great tool, but can be made more appealing to most members. It should include technical content related to current technology news in the region, so that we serve our members by keeping them informed of the technological advances and challenges that are specific to their geographical area. Students and YPs need to play a fundamental role in the IEEE structure. It is often said that they are the future of IEEE but we are not accomplishing that promise. Most of the student and young members leave, in many cases because we are not able to engage them. We need to provide more opportunities to volunteer and to become active. Provide them with opportunities to volunteer and be engaged. Show that IEEE membership is useful in our professional lives at all ages.